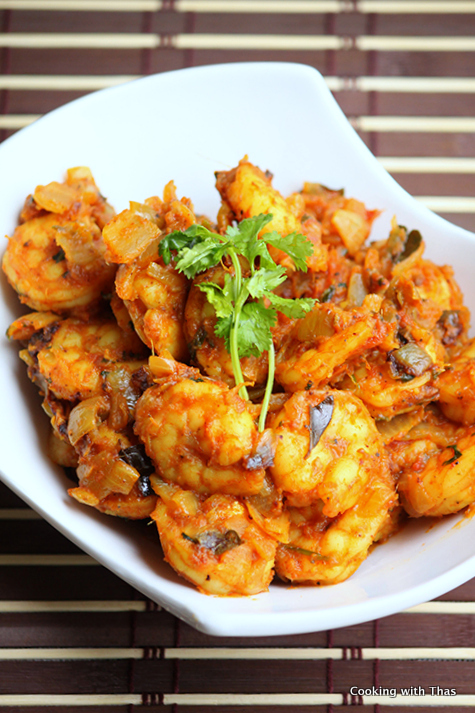 This is an aromatic and flavorful dry dish, shrimp is roasted over high heat till it’s coated with the masala and turns light brown, tastes delicious and can be served with rotis or rice. Into a blender, add all the ingredients mentioned 'to grind' along with ¼ cup water and grind to a paste. Keep aside. Soak 2 inch fresh tamarind in 3 tbsp water for 5 minutes. Using your finger, squeeze the soaked tamarind in water, drain the juice and discard the skin. Place a non-stick pan over medium heat, add oil and ghee. Add onions and curry leaves, season with salt and cook till onions turn soft. Add chopped tomato, cook till mashed. Add the ground paste, combine well and cook for a few minutes. Add Kashmiri red chili powder, turmeric powder, coriander powder and enough salt to taste, combine well and cook for a minute. Add the shrimp, combine well. Add tamarind juice and cook covered till shrimp has cooked well. 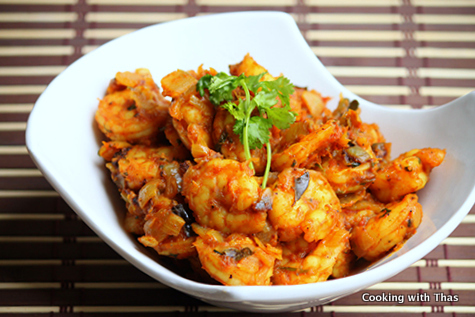 Open the lid, turn the heat to high and stir fry till the masala coats well on shrimp, all the liquid has dried off and shrimp turns golden brown. Add chopped cilantro and drizzle with lemon juice. Stir fry for a minute and remove the pan from the heat. Keep covered for a few minutes. 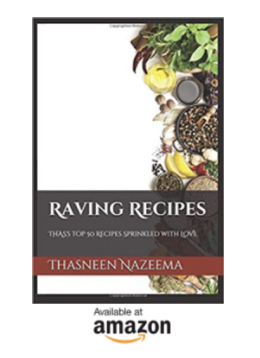 Serve this with roti, chapati or rice.